I know I've neglected this blog for a few weeks, I've tried a few times to write an update but never really got very far, not because I wasn't doing very well, but because I didn't want to get ahead of myself. I've given myself a few weeks since I started my sessions with a new PT, the focus on triathlon training and eating plan so I could see some real results, and I'm pleased to say that I really have. My sessions with Phil have been going really well, I'm now four weeks into a ten week course and am definitely seeing the benefit, I already feel much stronger and that my body shape is changing. Phil really pushes me quite hard in these sessions and I will be sad when they are over, I really feel that I have been listened to and the sessions have been adapted around my interests outside of the gym, so improving my running technique and speed, and building muscle to help build speed with cycling and swimming. Phil has quickly become known as "The Boss" over the last few weeks, and I seem to quickly become known as "The Moaner", I have since made a point not to moan during sessions, to the point where Phil asked me if I was actually ill! I'm now running faster than ever before! So, next year I will be completing Outlaw 70.3. I had decided a few weeks ago that I was going to do it, but knew that I had a lot of work to do, but now there is a difference, I now believe that I can do it. Part of this reason could be that I'm getting more confident in the water, and on the bike (indicating is getting easier, bloody twitchy thing!) but it's mainly because I've just seen @TheIron_Bear complete his first Ironman in 12:15:49, he's written a great post about the race itself which you can read here. I won't go on too much about it, I've written a guest post for him that I guess he will get round to posting at some point. He went as he puts it from "Lardman to Ironman" so I see no reason why I can't do the same! The pounds are coming off nicely and I have had some great twitter support over the last few weeks from @michybrightside and @rach_2_oh where we have been checking in daily on our diet and exercise, and giving each other the lift that we need to keep going. I have to say, I have found this invaluable on days where I've really wanted to over indulge and the girls have been great. We have also put together a relay team for a 70.3 next year, I will be taking the bike leg, and seeing as though @Rach_2_oh is a pretty amazing swimmer I think I will need to get used to the sound of TT bikes whizzing passed me during the ride!! It seems I'm disappearing a bit more, huzzah! 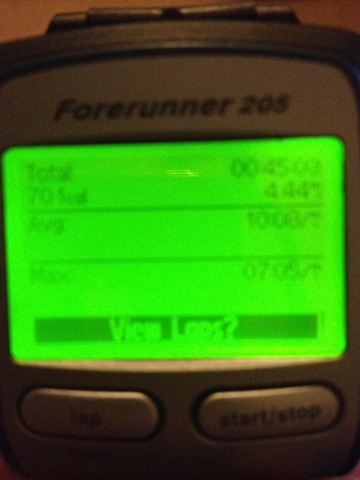 The last couple of weeks have also seen some improvements in my running speed. I told Phil last week that I seemed to be running consistantly at about 10:30 minute miles, he said he wanted to see me running at least 10 minute miles, I get the feeling he will keep challenging me like this over the weeks! Over the last few months I had been going to Regency Runners and going on the 3 mile run, never upping the distance. I knew that I had a 10k race coming up which meant I would have to run the longer distance last night, which is generally ran by the faster runners, which would again leave me at the back, not somewhere I'm keen on running. I had decided to just run to how I felt, I didn't even try to keep up as they run much faster than I can manage but I wanted to keep them in my sights on the 4.5mile route. To be fair, I always had someone in my sights and I tried as much as I could to get closer to them but couldn't quite do it. As I went through mile 3, I looked at my watch and saw I was running at a really good pace for me, in fact a PB for 5k, with 1.5miles still left to run I doubted that I could do it and I slowed a little, which allowed Jude to catch me up. At this point, I didn't mind if I ended up being last as I knew that I was doing well, and considered taking the foot off the gas and being pleased with what I had done, but I didn't and carried on, i remembered @TheIron_Bear telling me i needed to learn how to hurt myself so i kept on. I knew that the rest of the route was flat or down hill, I'd done the hills so I felt it was now time to prove to myself that this wasn't a fluke. I finished the run (with a lot of encouragement from the run leader, Mel) and stopped my watch, I couldn't quite believe what I had just done! To some of you real runners, you'll see this and ask what the big deal is, but to me, it's massive! When I was training for VLM my pace was between 12 and 13 minute miles, last night I ran a average of 10:08 minute miles over 4.44 miles, my time being 45:03, this is the fastest that I have EVER ran and 22 seconds a mile faster than my usual average speed over a shorter distance! I'm not ashamed to say that I cried a little at what I had just done, although they were happy tears!! So, now I can swim without feeling the need to stop at the end of every length, and have my first open water swim next Thursday. I can ride my bike and now the weight is coming down the hills are getting easier and not quite as slow. I am getting stronger and my weight is heading in the right direction. I am running faster than I ever have done before. The difference in me now to 6 weeks ago? I believe in myself. I can do it. Wow Lozza! 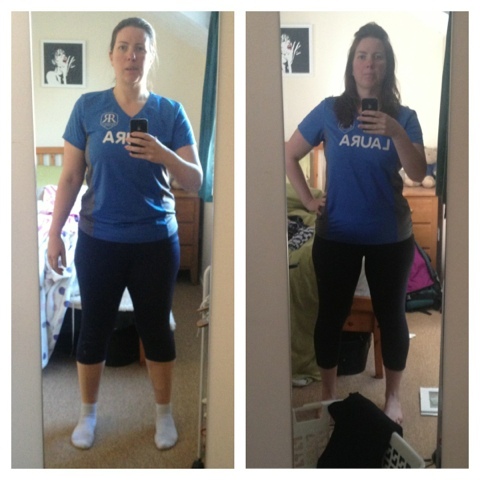 There's a lot of difference between the pics - it really shows how hard you've been working!! Brilliant on the speed too - 12 - 13 min/miles down to just over 10! That's such a huge leap - well done!! You are going to NAIL that 70.3 next year! !